The facade of this house has the shape of a keyhole. A key to open “my house”, which is standing along a narrow street of a crowded town, is designed as a key itself on the façade of this house. A house can be called a key, which will open up your life happily. Such a small key, this house is a key! The site is in Kyoto, Japan. 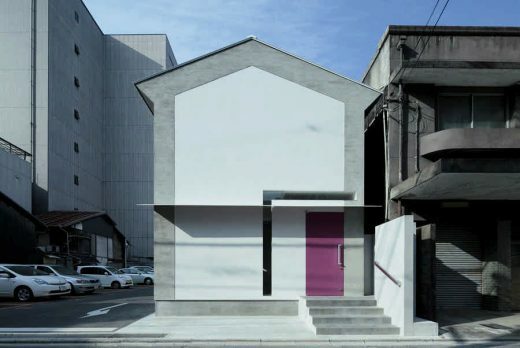 It is a small house for four people and two cats. It has only 100 square meters of floor space. It is standing alone in the corner of a small parking lot like a table left behind at the seaside. ・The façade is marked by a window shaped like a key. ・Mortar with sumi ink is applied to the exterior wall. ・Simple color coding. Red and purple are used as an accent. ・Random arrangement of small windows. ・The edge to make the shape of this house clearer. You sometimes will see a cat lying by the window at this house. You wonder what she is watching. Do you still have a naïve heart with a key to open this house?